Off-roaders and outdoor adventurers have turned to the Jeep Wrangler and its nimble predecessors for decades as the vehicle-of-choice for going well off the beaten path. Throw a tent, sleeping bag, and cooler in the back and you have everything necessary for a weekend wilderness getaway. Instead of using the Jeep to get to the campsite, however, California-based American Fastbacks turns the Jeep into the campsite. This build is called the American Fastbacks Badlands, and as you can see, it's a rolling, off-roading, Wrangler recreational vehicle with accommodations for four thanks to a nifty roof-mounted tent. It's actually an electrically operated hardtop camper that mounts to the Jeep's roof, featuring an aluminum frame with a wool mattress that can fit two people. 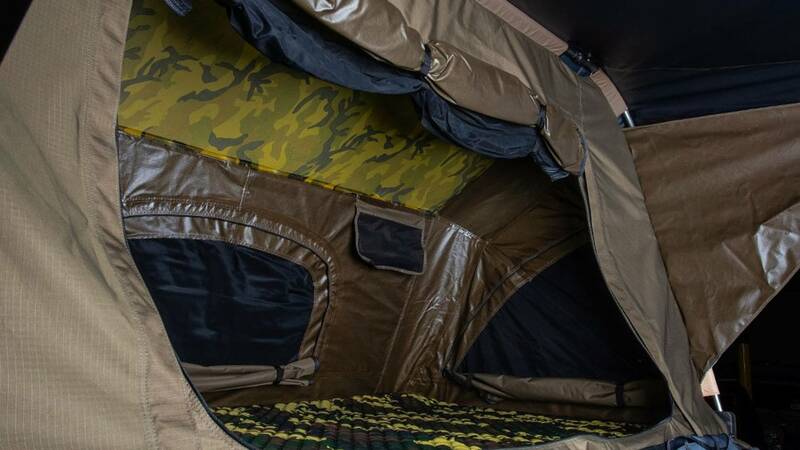 It's not exactly clear how you get up to the roof for a good night's sleep, but if you're bombing through the wilderness in a Jeep camper, such details are likely a non-issue. If you don't want to shimmy up top, the Badlands also includes a rear sleeper kit for the Wrangler's interior that converts the rear seats and cargo area into a bungalow for two. The special build also comes with a small galley that includes a mini-fridge, propane stove with two burners, and yes, it even includes the kitchen sink. We're not sure how that all fits into the tight confines of the Wrangler's four-door greenhouse, but it's all part of the package. Also included on this Wrangler RV are plenty of off-road upgrades. It gets a 2.5-inch lift kit and 20-inch wheels with 35-inch tires. Off-road bumpers are installed front and rear, with a 10,500-pound winch up front for getting out of trouble. Body treatments include a custom grille, fenders, powered running boards, and the requisite LED lighting. Inside, the interior is further spruced up with custom leather seats wearing American Fastbacks branding. The company is also keen to let people know its Badlands Jeep is RVIA certified.